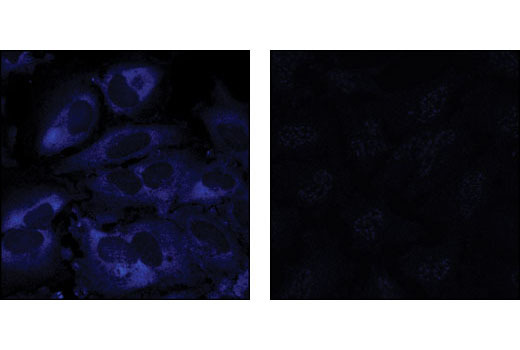 Confocal immunofluorescent analysis of HeLa cells treated with 20% serum (left) or with Rapamycin, Wortmannin and U0126 inhibitors (right) using Phospho-S6 Ribosomal Protein (Ser235/236) (D57.2.2E) XP® Rabbit mAb (Alexa Fluor® 647 Conjugate) #4851. Flow cytometric analysis of Jurkat cells, untreated (green) or treated with LY294002 #9901, Wortmannin #9951, and U0126 #9903 (50 μM, 1 μM, and 10 μM, 3 hr; blue) using Phospho-S6 Ribosomal Protein (Ser235/236) (D57.2.2E) XP® Rabbit mAb (Alexa Fluor® 647 Conjugate) (solid lines) or concentration-matched Rabbit (DA1E) mAb IgG XP® Isotype Control (Alexa Fluor® 647 Conjugate) #2985 (dashed lines). 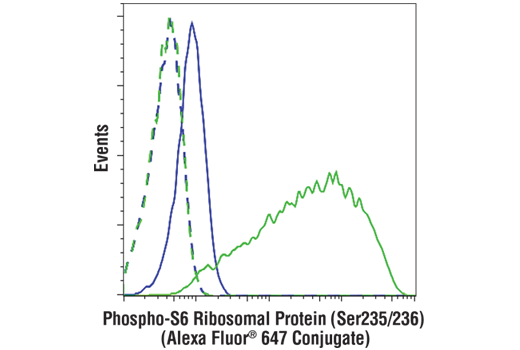 Phospho-S6 Ribosomal Protein (Ser235/236) (D57.2.2E) XP® Rabbit mAb (Alexa Fluor® 647 Conjugate) detects endogenous levels of ribosomal protein S6 only when phosphorylated at Ser235 and 236. Monoclonal antibody is produced by immunizing animals with a synthetic phosphopeptide corresponding to residues surrounding Ser235 and Ser236 of human ribosomal protein S6. The antibody was conjugated to Alexa Fluor® 647 under optimal conditions with an F/P ratio of 2-5. The Alexa Fluor® 647 dye is maximally excited by red light (e.g. 633 nm He-Ne laser). Antibody conjugates of the Alexa Fluor® 647 dye produce bright far-red-fluorescence emission, with a peak at 665 nm. This Cell Signaling Technology antibody is conjugated to Alexa Fluor® 647 fluorescent dye and tested in-house for direct flow cytometry and immunofluorescent analysis in human cells. The antibody is expected to exhibit the same species cross-reactivity as the unconjugated Phospho-S6 Ribosomal Protein (Ser235/236) (D57.2.2E) XP® Rabbit mAb #4858.